Teien Art Museum's Exhibition "Decoration Never Dies, Anyway." text and photos by Roisin Inglesby, except where noted otherwise. November marked the long-awaited re-opening of the Tokyo Metropolitan Teien Art Museum, where I recently had the luck of enjoying some behind-the-scenes access to the installation of a lively and challenging new exhibition, the intriguingly entitled “Decoration Never Dies, Anyway.” The exhibition, which brings together contemporary artists from around the world, has turned the museum, a private residence built in the Art Deco style of the 1930s, into a delightful journey of the unexpected, enabling visitors to explore over 60 works created by seven artists and designers. 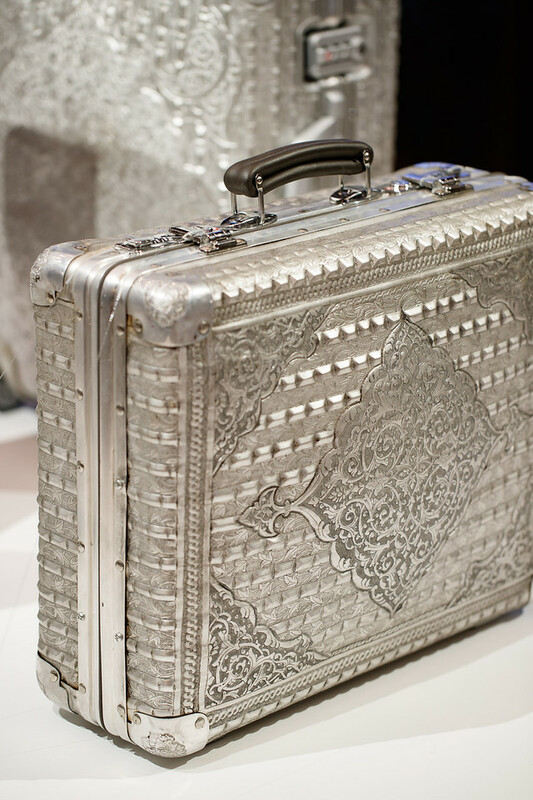 On entering the museum, the first objects to catch a visitor’s eye are three intricately engraved aluminum suitcases by Wim Delvoye, perhaps the most prominent artist featured in the exhibition. 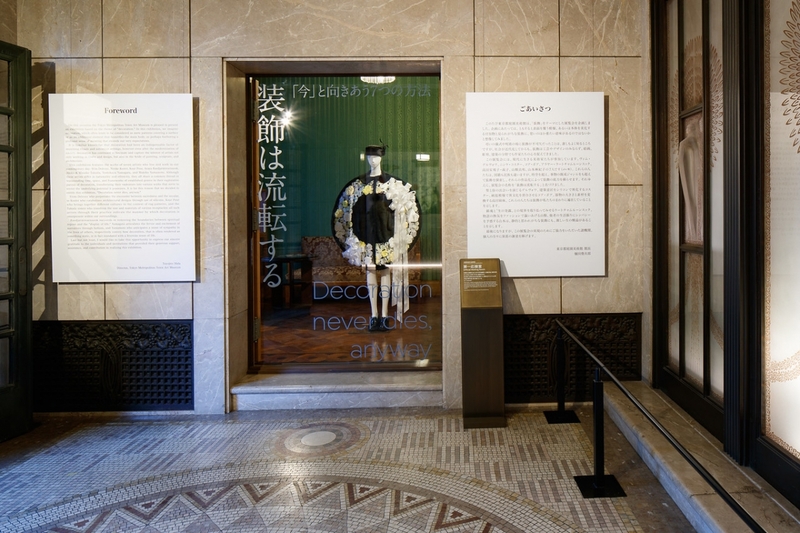 Delvoye is already known in Japan, having exhibited at the Yokohama Triennale in 2014. Occupying a plinth at the center of the entrance hall, his suitcases retain their plastic handles and wheels, and the juxtaposition of functionality and ornate decoration is both amusing and intriguing. I found myself wondering whether the curators intended these objects to be emblematic of the Art Deco movement as a whole, in which functional objects such as radiator covers and air vents were treated as blank canvases for decorative detail. 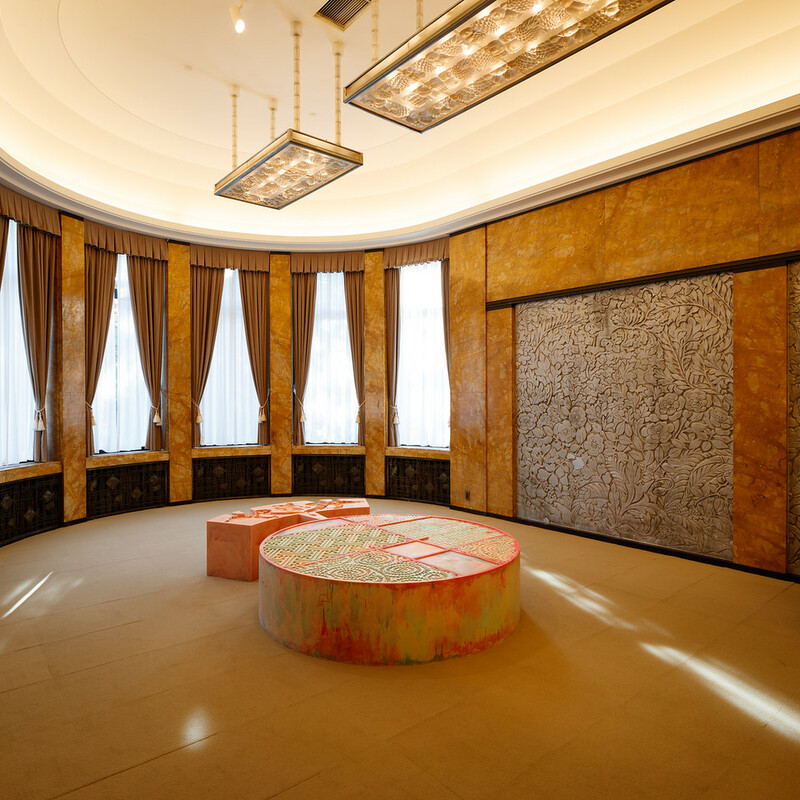 Indeed, as I moved throughout the museum, I constantly noticed striking Art Deco motifs throughout the original fabric of the building — from the keyholes to the light fittings, everything in the Teien Museum is a riot of decoration. 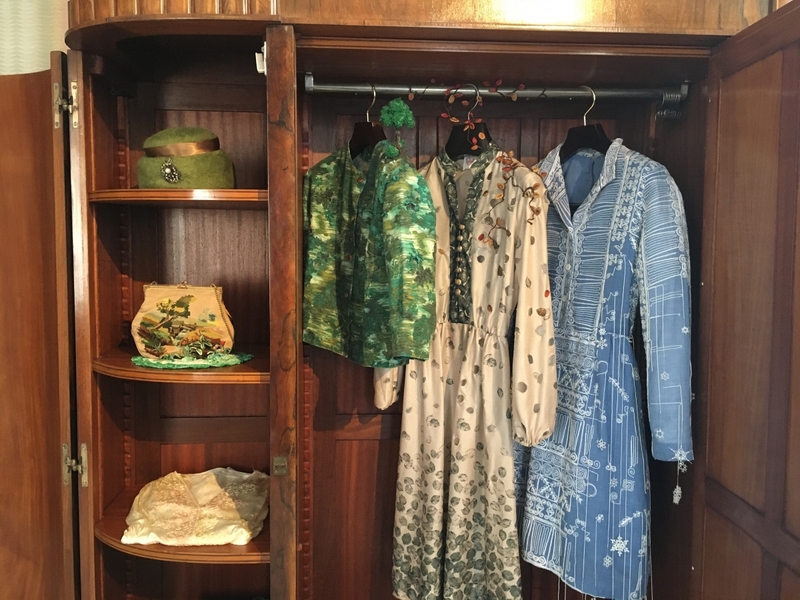 Delvoye’s other exhibits continue this theme; alongside the luggage I spotted two large, rubber tires carved with intricate patterns, and in an adjacent room was a jaw-droppingly ornate model of a flatbed trailer, created using Gothic motifs. As I marvelled at the sheer detail of the piece, I was struck by Delvoye’s skill in taking the aesthetic of a medieval cathedral and transforming it into an everyday 20th century object. 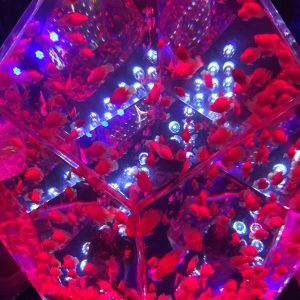 Decoration, as the show’s co-curator, Masako Tanaka, told me, is something which persists, being recreated and reformulated over time and embracing different meanings and ideas. The idea behind this exhibition is to show how a variety of decorative motifs can be used across a range of media in new and surprising ways – all in the context of daily life. 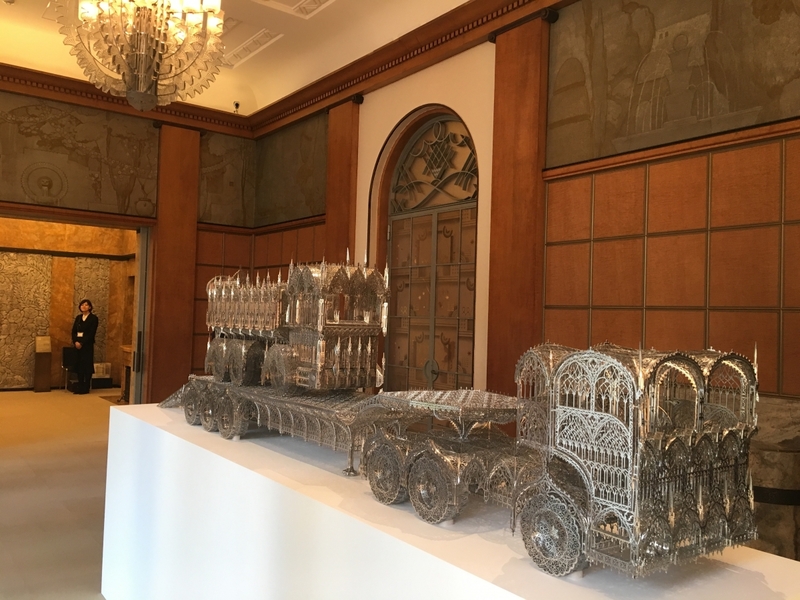 Wim Delvoye, Flatbed Trailer, 2014, displayed in the Drawing Room. 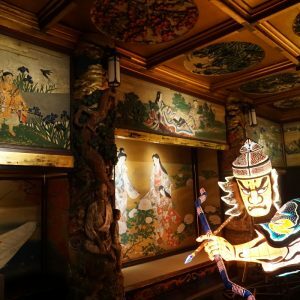 Next on my tour, I was led to a room which once served as the dining room for the Asaka branch of the Japanese Imperial family who originally lived in this building. In place of a dining table, however, I found a large, brightly-colored work by the Dutch artist Nynke Koster. Koster was inspired to create this piece, a circular, knee-high rubber sculpture called “Bridge to the Netherlands,” when she researched the former Dutch trading island of Dejima, which for 200 years operated as a bridge between Japan and the rest of the world. Koster told me that she enjoys the malleability of rubber, which she moulds and then paints, and its ability to recreate decorative details in a tactile form. Elsewhere in the museum, visitors can use Koster’s work to come into close contact with historical design, in the form of seats cast from decorative details she has found in various locations. Continuing my journey around the house, I headed upstairs, pausing on the way to admire the original decoration of the bannister. A Decorative Staircase in the Teien Musuem. 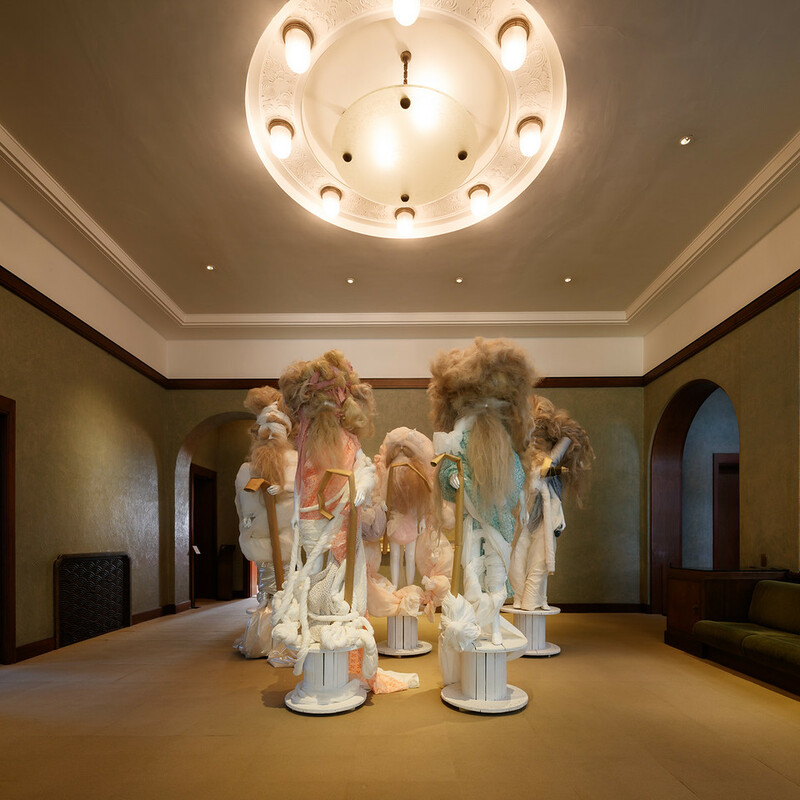 At the top of the stairs I stopped short, confronted by five larger-than-life figures created by Japanese designer Yoshikazu Yamagata. This work, entitled “The Fashion Show of the Gods,” features mannequins festooned in swathes of fabric, their faces obscured by overgrown hair and beards. They each carry a crumpled cardboard tube, the inside of a roll of fabric, in place of a walking staff. Yet, for all of the eccentricity of the figures, Yamagata managed to instantly remind me of my local statue of Ebisu, one of the Japanese gods of fortune referenced by this work. Alongside the more visually imposing installations on display, some of my favorites are the quiet and beguiling interventions by twin sisters Akiko and Masako Takada. In their hands, mundane domestic features such as a bathroom sink, a wardrobe, and a fireplace become the locus of thoughtful and somewhat mischievous interventions. The artists play with our sense of scale by creating miniature worlds within worlds. The effect made me feel like I was playing hide-and-seek with their exhibits, which include a domestic scene within a fireplace, an array of playing cards transformed into Persian rugs, and what can only be described as a seasonal, “capsule wardrobe,” in which four items of clothing are transformed into representations of the four seasons and quietly displayed in a wardrobe in what was once the young princess’s bedroom. Akiko and Masako Takada, ‘In the Wardrobe’, 2017, showing from left to right, Spring, Summer, Autumn and Winter. I was privileged to speak with the sisters during the installation of their works. “We try to imagine that we are viewing ourselves from above,“ they explained. “The works we create are meant to challenge conceptions of size and how we relate to objects.” Throughout our conversations, the sisters both referred to their works using the words “our” and “we,” and so I was especially interested to know how they went about creating the pieces — individually, or together. Akiko laughed as she told me that when making a pumicestone replica of a triumphal arch (which I discovered in a bathroom sink), they had a competition to see who could make the best one. On this occasion, she won — and so, her example is on display. Proceeding from the original building to the modern annex via the newly-installed elevator (which now enables visitors with limited mobility to access the upper floor), I entered the first of two purpose-built gallery spaces. In contrast with the scale of the original building, which both complements and limits what can be shown there, the expansive white walls of the new space perfectly lend themselves to contemporary art exhibitions. Here I find eight large scale works by British-Iranian artist Kour Pour, who at 30 is the youngest artist featured in the exhibition. He create paintings that resemble Persian carpets, which he was surrounded by in his father’s shop while growing up in the English city of Exeter. However, as he explains, Pour’s mixed heritage and multifaceted identity inspires him to take decorative elements from a variety of different sources in his art. 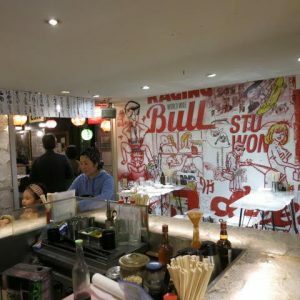 “Sometimes I just feel like doing a straight-up representation”, he told me in his Los Angeles-influenced British accent. But his more recent works also incorporate decorative motifs from worlds as diverse as ancient Rome and Egypt. He explained how he employs a combination of screen printing, painting and sanding to create a g striking, aged texture, and from afar, I really did feel like I was looking at historic Persian carpets hanging on the wall. After viewing the final work on my itinerary — a video made by Thai artist Araya Rasdjarmrearnsook — I headed into the museum’s spacious garden, where the splendor of Japanese autumn leaves was on full display. “Teien” means garden, and if possible I would recommend visiting on a pleasant day in order to fully enjoy everything the museum has to offer. 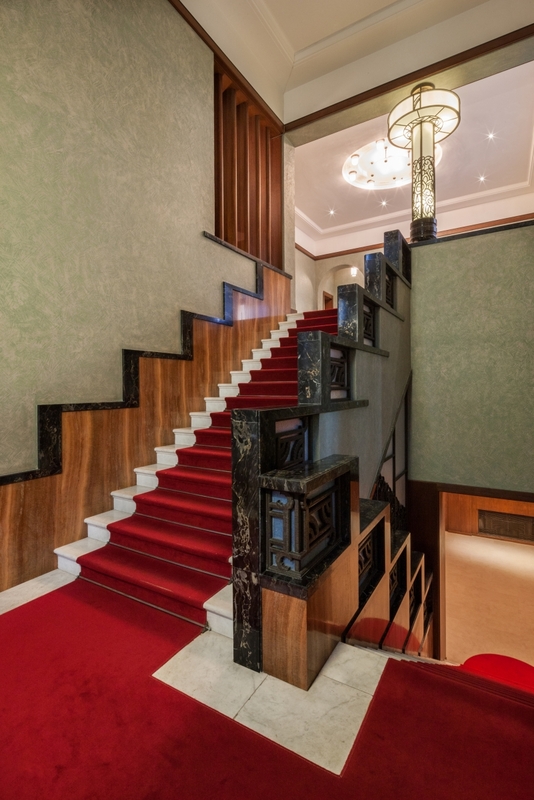 Viewing the original house, which miraculously survived wartime bombing, from the outside, I spotted even more Art Deco details in the windows and air vents, adding to my final impression that decoration really does never die, anyway. Museum admission: Y1,100 for adults, with various discounts available. Hours 10:00-18:00 (Last admission 17:30), closed second and fourth Wednesday of the month.